George Clooney has gotten a lot of play in our house over the past couple of weeks. At The Descendents movie, we watched a guy who has never been a father play a man who doesn’t know how to be a dad evolve into a pretty cool pop. 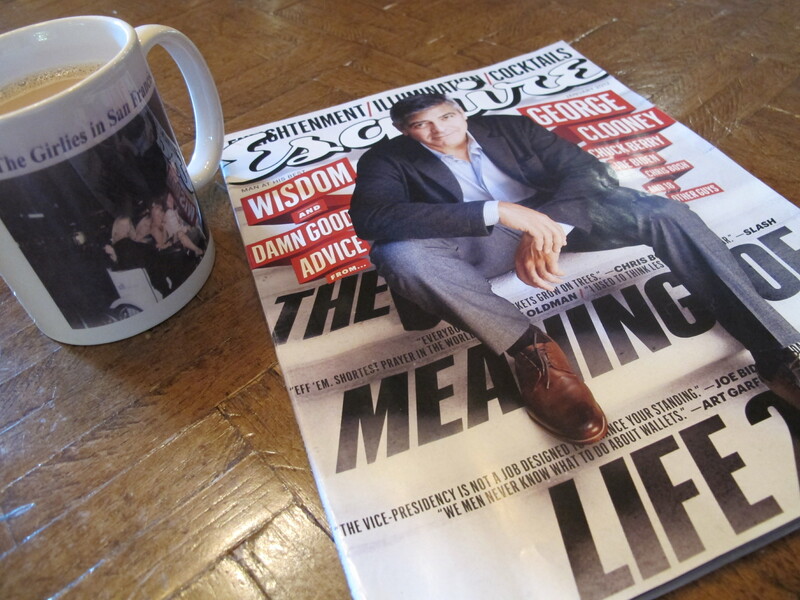 In the doctor’s office the next day, I picked up the latest edition of Esquire magazine because the cover touted “The Meaning of Life 2012” and contained “Wisdom & Damn Good Advice” from none other than cover boy George himself. How could I resist? This, after listening to a couple of manly Haertl men joke about hanging out with the Cloonster and hearing my zesty mother-in-law and college coed daughters gush on about the universal dreamboat. You got that right, George, especially with all the feuding, bickering and backstabbing that goes on in politics. Republican or Democrat – forget about party lines. It’s all about compromise, finding a way to cross those lines and create working solutions for all. Politics revolve around salesmanship – if you can sell an idea, it’s in play. Look at Ronald Reagan – he was not an economist, yet Reaganomics became bona fide albeit controversial economic policy. Whether or not we agreed with his views, things just seemed to be a little happier in the world with the good old Gipper’s easy manner and disarming smile. qualifications are questionable, but he sure can spin a good pitch. Mr. Clooney likes to surround himself with colorful characters and bright minds, so he would undoubtedly assemble a cabinet full of the sharpest political figures. They could formulate strategies and President Clooney could sell like crazy. Imagine how much happier our entire country would be with George smiling at us every night, telling us things are going to work out just fine. And when the going gets tough, his smooth grit would look us square in the eye and give us the straight-up truth. Cloonster for Prez! That’s my political fairy tale. Hey a girl can dream, can’t she?